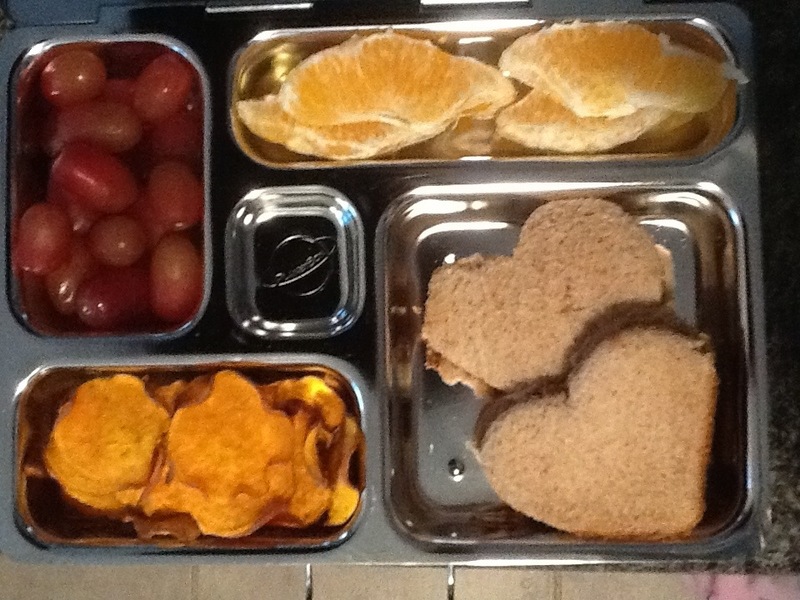 Peanut butter and jelly on whole wheat cut into hearts, orange slices, grapes and homemade sweet potato chips. 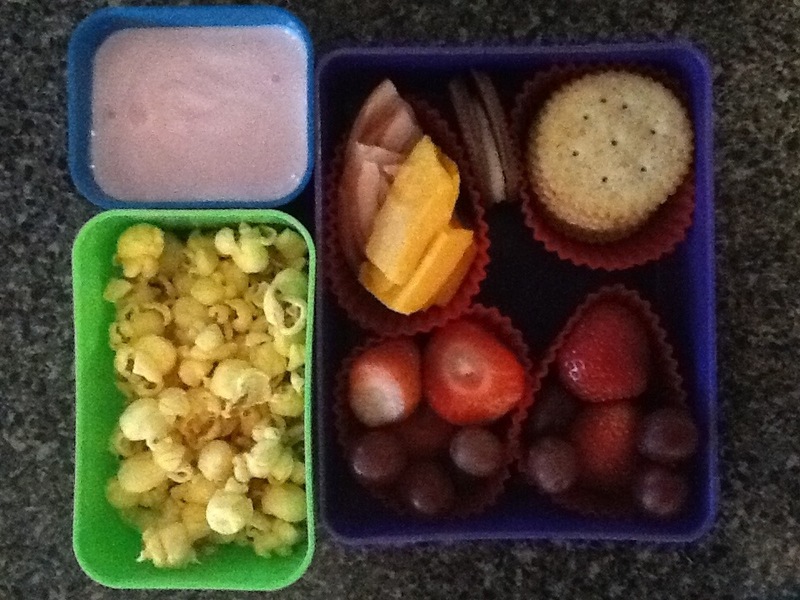 Lunchables are a fairly popular item for quick lunch boxes, but contain ingredients I don’t care to offer my kids, not to mention you can make these a lot cheaper on your own! Men’s Health listed the turkey lunchable meal the kids meal with the most sugar and a group of dietitians for the non profit Cancer Project reviewed 60 pre packaged kids lunches and listed the 5 worst here. Bottom line is that pre packaged, processed foods are convenient, but not good for you. 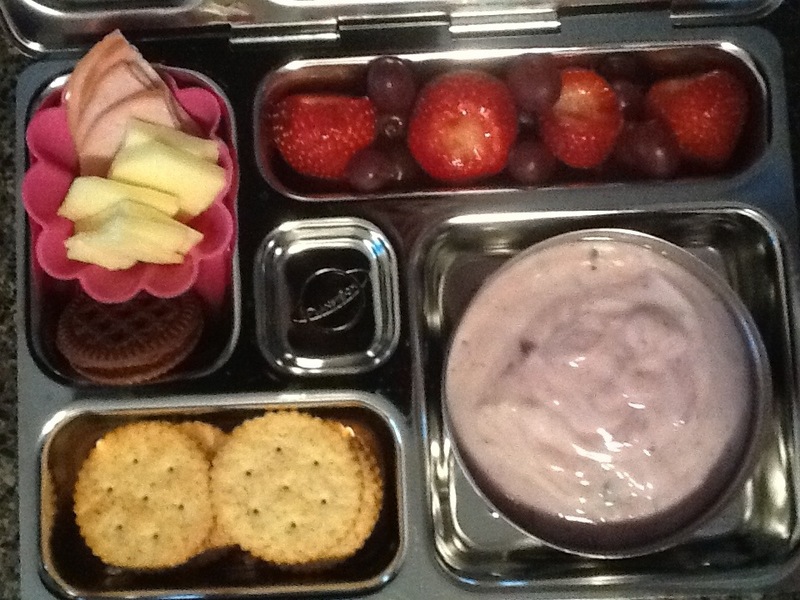 Making your own lunchable with healthier options of real, minimally processed cheese, no hormone and nitrate-free meat (organic is possible), and whole wheat crackers make a better option. 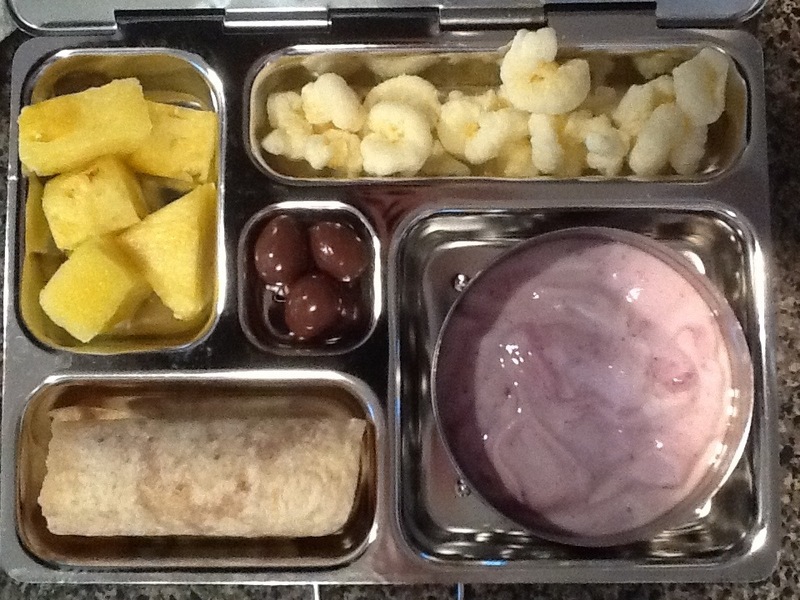 Certainly, a lunchable style lunch is a little more fun too. It’s actually easy and not as time consuming as you would think. 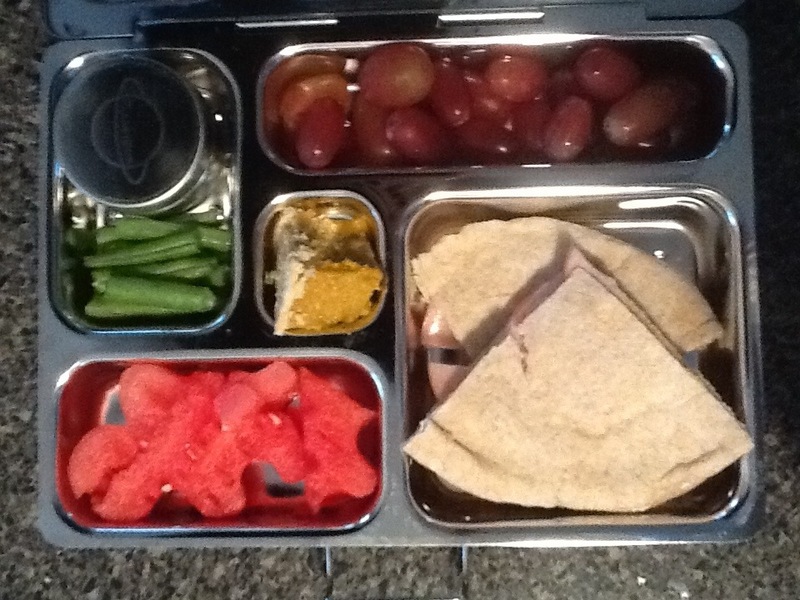 My DIY lunchable was Canadian bacon (ham) cut into triangles, cheese slices and whole wheat crackers. 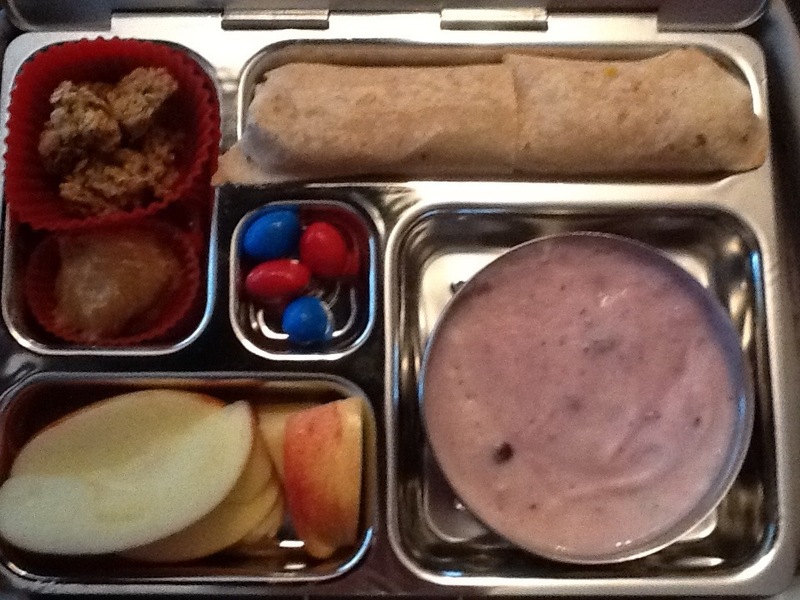 I also included yogurt, granola, strawberries, grapes and an organic “Oreo” for our special treat. Our drink was a treat too, took a break from our usual water and offered raspberry lemonade. My son had the same, no granola, but I gave him a little popcorn. With her pita pocket, I included grapes, a gingerbread man shaped watermelon slice, some fresh green beans and marinates asparagus. Our treat was a bit of pumpkin pie. She LOVES the asparagus. You can easily cut the asparagus into 1 inch sections and marinate in Garlic Expression dressing, however, I didn’t have time to go get this, so I created my own knock off version. I used roughly 1/3 cup apple cider vinegar, 1 tbls olive oil (canola may be better), 1 large minced garlic clove, salt, pepper, onion powder and celery seed to taste. I whisked it all together and let the asparagus marinate until we were ready to eat. She loves it!! 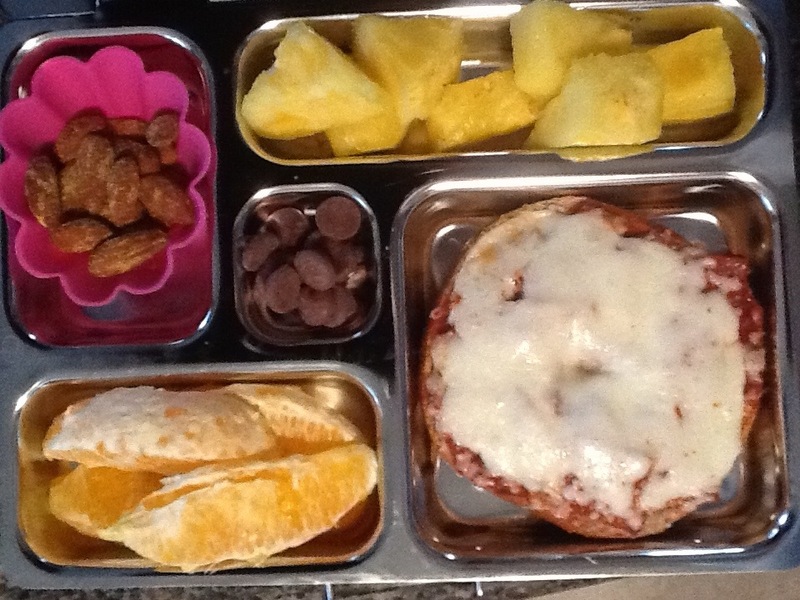 Today’s healthy bento box lunch: pizza bagel! 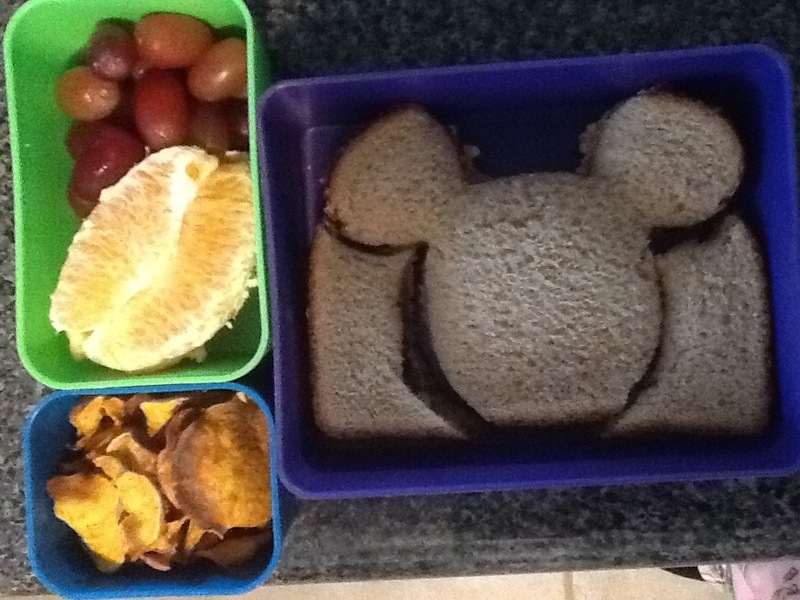 Today my daughters school served pizza bagels for lunch, so I thought I would send one in her lunch box too! Pizza bagel with all natural pepperoni on whole wheat bagel, orange slices, fresh pineapple chunks, honey Dijon almonds and a few chocolate chips as a treat. I made the pizza bagel with a whole wheat bagel, used a heaping tablespoon of natural pizza sauce, arranged pepperoni on top, then shredded desired amount of mozzarella on top of that. I put in the toaster oven on 400 for a few minutes until cheese was melted. Whaalaa! Lunch! 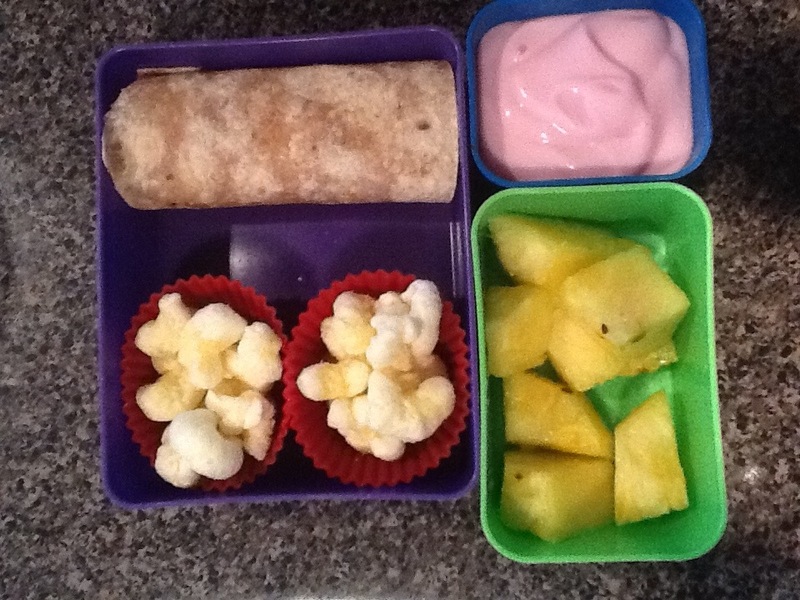 I didn’t post my daughters lunch yesterday. Time just got away from me and I forgot! 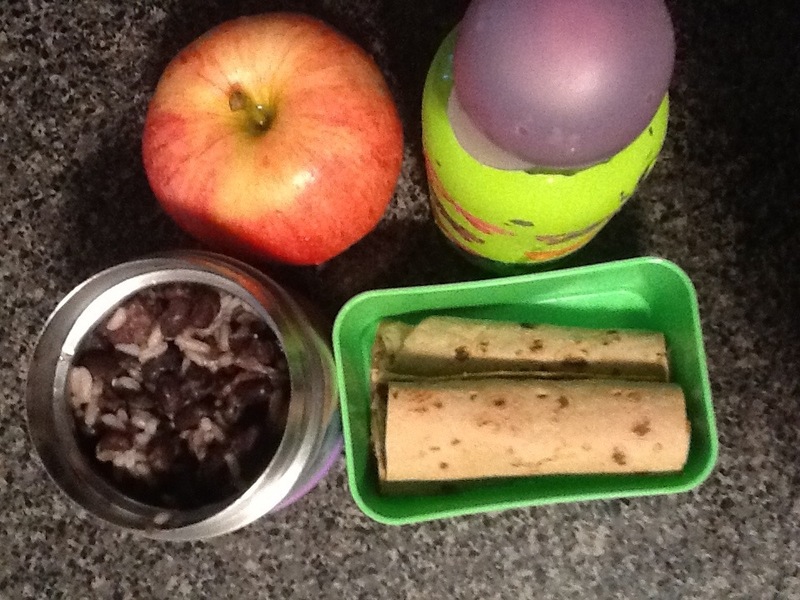 She had rice and beans (rice, black beans, onions, with bits of sausage and bacon). Plus peanut butter and strawberry jelly roll ups. The apple was her snack. 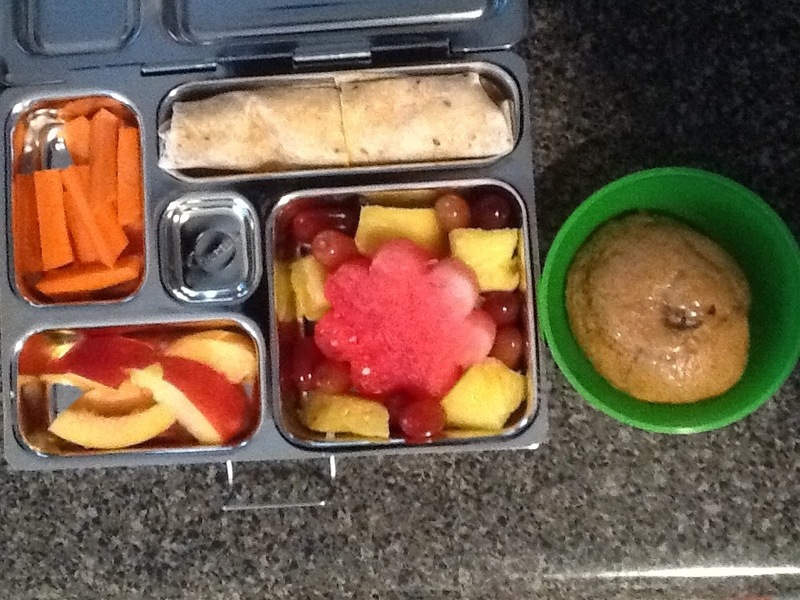 Today my son packed daddy’s “concoction,” cucumber and cream cheese roll ups, tomato slices and plum slices. So you are wondering what concoction is? 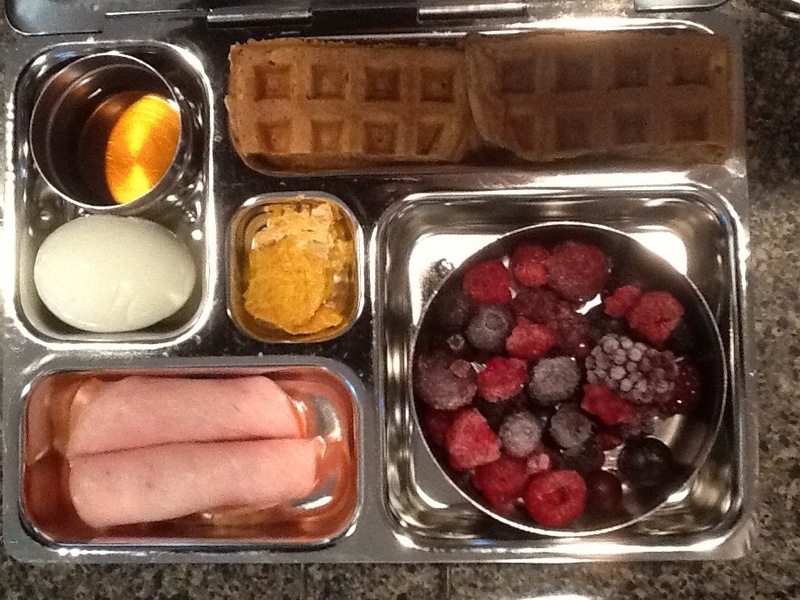 Something my husband invented after learning more about the Paleo diet. He (OK, I) take romaine (or other dark leafy green like kale), carrots, onion, bell pepper, cucumber and broccoli and run it through the food processor. Just use your desired amount of each item. We top that with sun dried tomatoes, sun flower seeds, apple cider vinegar, tobacco and sometimes extra virgin olive oil. 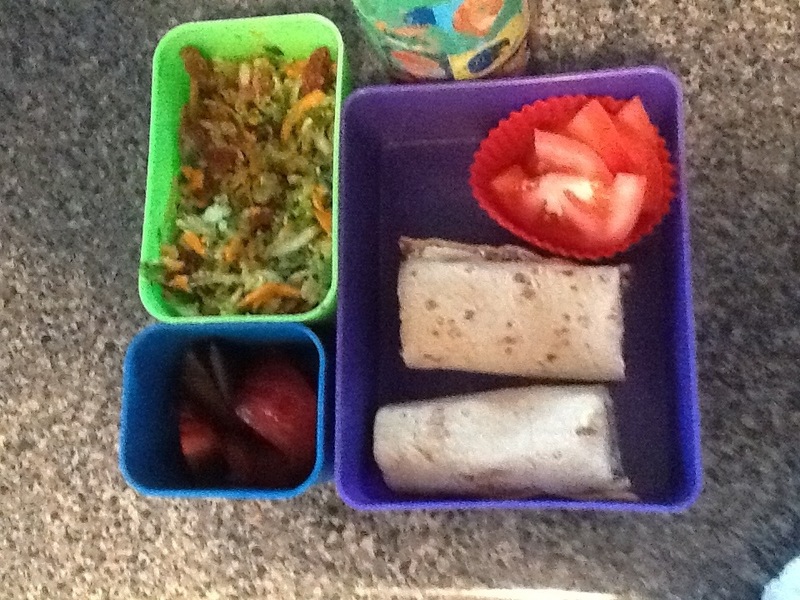 My son usually prefers it without the ACV, so basically just eats a bowl of shredded veggies! And he absolutely LOVES it.